WHAT DAMAGE DOES CAVITATION CAUSE? The damage due to cavitation can range from minor pitting to a total breach of the inside of the pump. Some people describe the damage as looking like Swiss cheese or as if "iron worms" have attacked it. 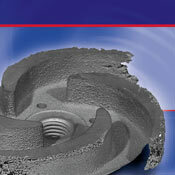 As evidenced by the pictures, severe cavitation destroys the parts it contacts. HOW TO CORRECT CAVITATION It is important to properly design the pumping system. (See the suggested procedure for calculating NPSH to avoid suction cavitation. Always calculate the total dynamic head to be within the operating range of the pump.) Correcting cavitation can be difficult if not impossible to do in an existing system. Atmospheric Pressure - 14.7 PSI or 33.9' of water under standard conditions at sea level. Ambient Temperature - The normal temperature at any given location at a given time. When figuring NPSH it is the temperature of the liquid. Vapor Pressure - The pressure at which a liquid will begin to vaporize. This pressure is relative to the temperature of the liquid. Implosion - To collapse or burst inward.